Cheap Carpet- When I say cheap carpet, I mean the stuff they sell for under $1 per square foot. Typically, this stuff is made from polyester blended materials. We find that by simply rubbing your hand across the top of the pile, yarns will pull out and fly all over the place. Our suggestion: Nylon carpet. You’ll thank me later. Cheap Seam Tape- Seam tape is basically thin paper and dry adhesive. Once a hot seaming iron is placed on top of the seam tape, it melts the adhesive. Extremely cheap seam tape will have the poorest quality adhesive, which might work for some carpet types, but render absolutely useless on others. A highly trained carpet installer or repairman should know the difference, and not skimp on the good stuff. Pets- Ah yes, the curious family pet. They find everything! Cats. Dogs. It doesn’t matter. If they get bored or curious and find an imperfection in the carpet seam, they’ll dig at it. Vacuum Cleaners- Some vacuum cleaners contain a part called a beater bar. The beater bar has a spiral shaped brush that helps scoop dirt particles and other debris into the vacuum cleaner. Those brushes rotate from the top and brush deep down into the bottom of the carpet pile. 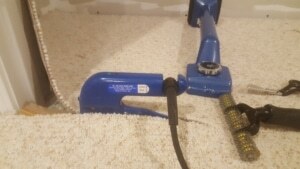 If there’s a split or opening in the carpet seam, over time, your vacuum could make the split seam much worse. Overstretching- All carpet has a backing. Most residential carpet has two backings with a layer of adhesive which holds both carpet backings together. When the carpet is stretched too tight, you can actually hear the sound of the carpet backings cracking. If there is a seam, it will be the first thing to separate, followed by the carpet backing. When you call Carpet Chemist at 800.515.1342, you’re assured of superior workmanship that exceeds industry standards and delivers proven solutions for an eye-catching, healthy home and carpet. Trained, certified and dependable, we’re your carpet specialist for life.